These aren't the envelopes you'd want to mess up. Go ahead, take a punch. You'll only be hurting yourself, you know. 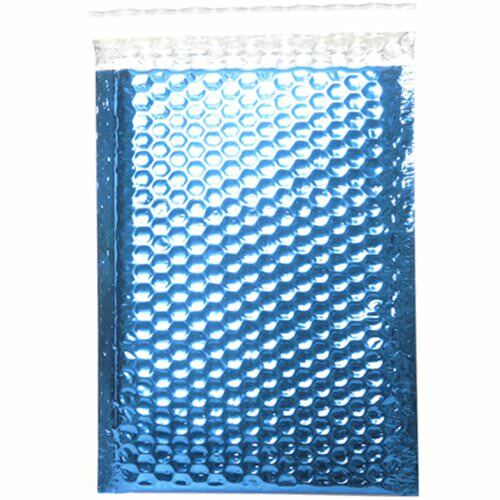 Blue Bubble Mailers are filled with padded bubbles, making sure that your content will be protected. They're like the Ronda Rousey of envelopes, but a little shinier! Use Blue 6 3/8 x 9 1/2 Envelopes to send jewelry, CD’s, DVD's, photographs and other fragile and important items. Their blue bright and stylish exterior offers an attractive alternative to a regular padded envelope but with the same strength ... again like our girl Ronda Rousey. These Blue 6.375 x 9.5 Envelopes come in a shiny and bright Metallic Blue. Best part? There are two different closure options! So when you want to be able to reuse again and again, go for our Velcro® Brand Closure. Or when you want to really, really, really make sure your envelope is sealed tight, try our self-adhesive strip. Peel, seal, and never see again (until it's opened by a very, very, very excited recipient).